The anti-narcotics agents have arrested a former barangay kagawad in Cotabato, the Philippine Drug Enforcement Agency (PDEA) said. PDEA Director General Aaron N. Aquino identified the suspect as Rustico Lobetania, 40, a former barangay kagawad and one of the provincial target-listed drug personality. The suspect was nabbed during the recent implementation of a search warrant in Purok 6B, Barangay Amasion, Kidapawan City, Cotabato. 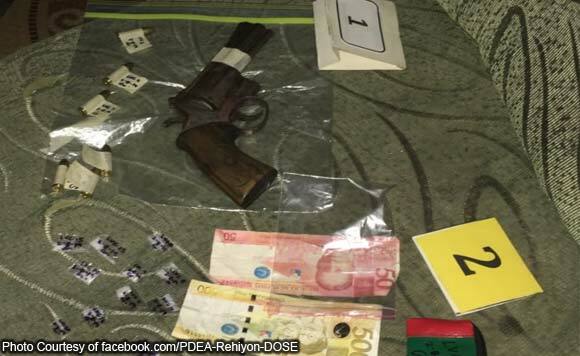 Confiscated during the operation were 13 small transparent plastic sachets of suspected methamphetamine hydrochloride, or shabu, weighing about 2 grams, with an estimated value of P13,600.00, and a caliber .38 revolver loaded with ammunition. The suspect will be charged for violation of Section 11 (Possession of Dangerous Drugs), Article II of Republic Act 9165, or the Comprehensive Dangerous Drugs Act of 2002. An additional charge for violation of Republic Act 10591, or The Comprehensive Law on Firearms and Ammunition will also be filed against the former local official.